To begin the school year and throughout each term, the school community celebrates with both class and whole school liturgies. We welcome parents and friends to celebrate these occasions with us. These events will be advertised in the school newsletter. Assemblies are held each week on Monday from 8.50am – 9am and Fridays from 2.30pm or 2.45pm – 3.10pm. Parents are encouraged to attend the Friday assemblies as they are an important community building activity. Masses will be held throughout each Term. Please watch the newsletter for details. Holy Days, Special Feast Days, Family Masses and special Sunday Masses appear on the calendar. The newsletter also informs you of such occasions. Sacramental celebrations and programs are also highlighted. Parents are most welcome and encouraged to attend on all of these occasions. A number of teams represent St Mary’s School in various inter-school programmes. These include events during our summer and winter sport programs. There are annual swimming and athletics carnivals. The focus of the sports program is on participating and skill development rather than competition. All students must wear the school sports uniform on the day indicated in the school newsletter unless a note accompanies your child giving reasons for this not being the case. Children must wear the correct school uniform when representing the school. 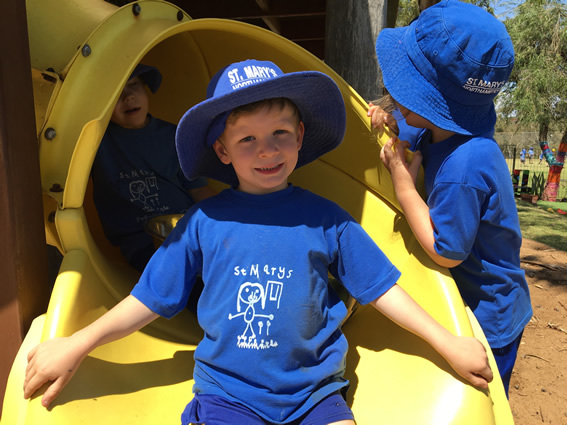 During school faction carnivals a coloured shirt will be supplied for each child to wear on the day. For weekly sports days the children are to wear their sports uniform.